Broncos-Steelers playoffs: The Steelers overestimated Tim Tebow before they underestimated him. The Steelers overestimated Tim Tebow before they underestimated him. 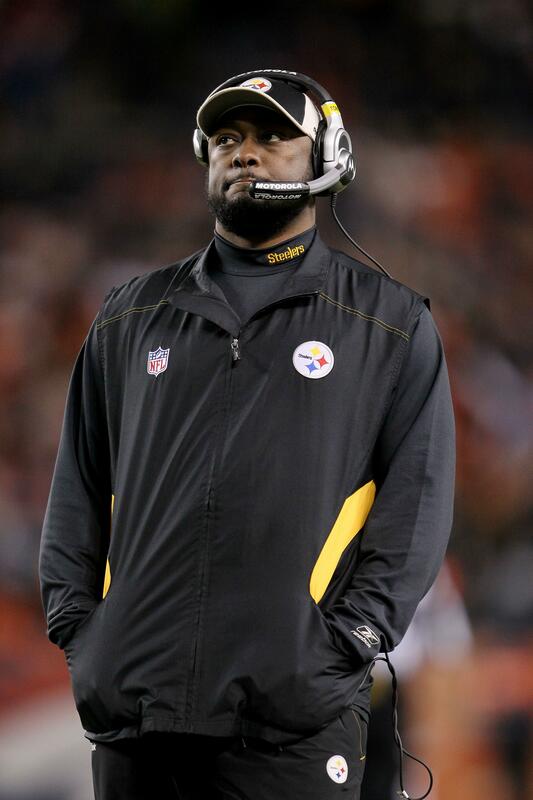 Steelers coach Mike Tomlin looks on during Pittsburgh’s Wild Card loss to the Broncos. Tim Tebow beat the Pittsburgh Steelers because he was Tim Tebow. He could also have lost because he’s Tim Tebow. His final pass of the fourth quarter was, as you said, Josh, the kind of play that’s a gimme for Drew Brees or Ben Roethlisberger or Tom Brady or Kurt Warner or, honestly, Phil Simms. A great passer would have made the connection there; a good passer would have at least put the ball where the receiver had a chance to make the play. Tebow sent the ball skidding into the dirt. If that had been the last throw of his season, it would have been an appropriate one. He’s a lousy passer. But the Steelers didn’t appreciate that fact. Yes, they embarrassed themselves on the game-ending touchdown, crowding the box as if they assumed it was physically impossible for Tebow to put the ball behind the defense—even though they had already seen otherwise. Note to future Broncos opponents: Try to give Tebow’s throwing at least as much respect as you’d give a halfback option pass. In the larger picture, though, the Steelers lost the game because they seemed to think they were playing against Tom Brady. Mike Tomlin’s clock-management problems at the end of regulation were set up much earlier in the quarter. After Denver’s Willis McGahee fumbled, the Steelers offense took over at their own 45-yard line, trailing by seven points, with 7:53 left. At that moment—through whatever combination of experience, conditioning, talent, and luck—Pittsburgh was clearly the better team. Denver had scored only a field goal since its first-half outburst; the Steelers had scored on long drives on their previous two possessions. Two more scores, and the world would be turned right-side-up again. Yet Pittsburgh appeared reluctant to take advantage. Over and over, Roethlisberger let the play clock dwindle to the final seconds. The Steelers were trying to run out the clock on themselves. They burned more than three-and-a-half minutes moving 24 yards to the Denver 31, before Roethlisberger snapped out of his trance and started firing for the end zone, to tie the game. What was Tomlin thinking? It was as if he was trying to keep Tebow on the sideline, for fear of losing a clutch-quarterbacking shootout between his two-time Super Bowl winner and the Broncos’ career 47 percent passer. In fact, playing for a tie made it more likely that the game could come down to a duel not between Roethlisberger and Tebow, but between Pittsburgh placekicker Shaun Suisham (who’d made 1 of 2 kicks from 50-plus yards this year) and Denver’s Matt Prater (3 of 4 from 50-plus yards). Maybe Pittsburgh was staking its hopes on the playoff overtime rules, in which Tebow’s usual brand of late-game heroics—a short, grinding drive to set up a long field goal in the thin air—would not have automatically won the game. An 80-yard touchdown, however, is still sudden death. First, the Steelers foolishly overestimated Tebow, then they recklessly underestimated him.